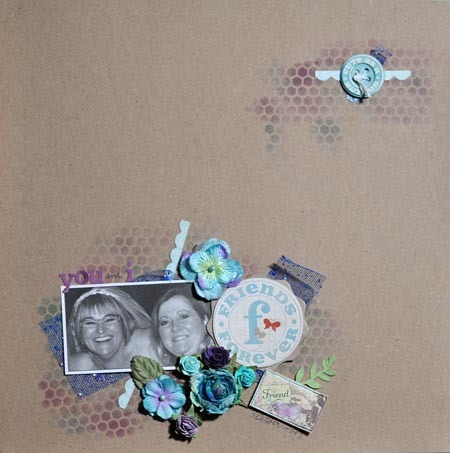 Over at Scrap Friends they have a very cool challenge, and that is to post your very first scrapbooking layout. I had to think for a while whether or not I wanted to do that. There are still two more days to join in if you dare!!! I was invited to join old school friends Lee Schertzing and Colleen Connors, who had taken a week off work to scrapbook together at Colleen’s place in Brockville. My response to them? “I’d rather gouge my eyes out”. 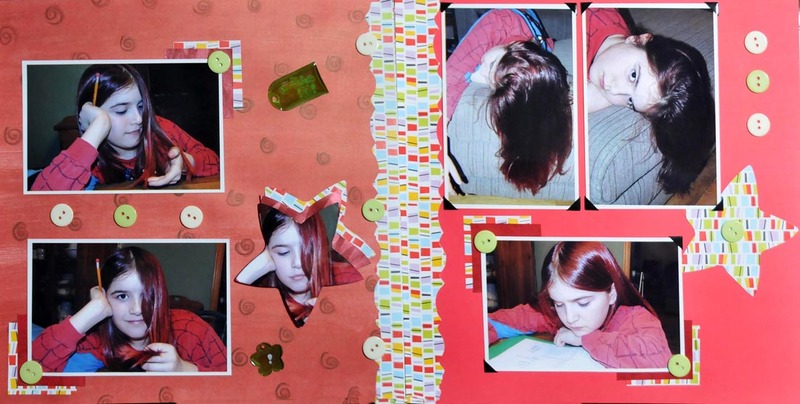 I couldn’t figure out why someone would waste holiday time to scrapbook. The girls would not be daunted. They asked me if I would take one day off work, and come up the night before to scrapbook with them for at least the evening and full day. I asked “Do you girls drink wine?” (Keep in mind I had not laid eyes on these girls since high school). They assured me that they would drink wine, so I consented to go. I packed my wine, my clothing, and a very cheesy boxed scrapbooking kid that I had bought a while before at Giant Tiger (for you non-Canadian girls, Giant Tiger is a discount store that is not noted for high quality merchandise). Anyway, did I ever have a lot to learn. The scrapbook album in my kit did not have sleeves to hold pages, and was completely unsuitable. A quick trip to the dollar store with one of the ladies and I had some inexpensive papers to use for scrapbooking. (The girls had offered to share theirs, but I didn’t want to impose anymore than I already had, and I knew by then that supplies could be expensive). Don’t forget to come out and play along with our two challenges this month at Another Freaking Scrappy Challenge. Scrap Africa’s challenge this month is to use hearts as the main accent on a layout. Here is my take on their challenge featuring my daughter Mary, son Chris, husband Scott and I at my dear friend Janice Caves-Frankland’s wedding in October 2009. 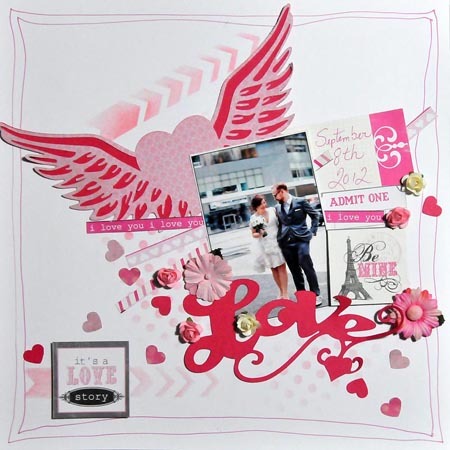 I am also entering this layout in the LOVE challenge at Get Creative and at Scrap and Grab. There is no doubt – I love my family!! 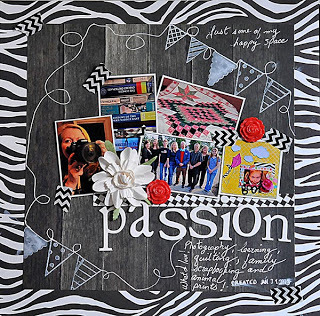 This is a layout for Kraft it Up’s February challenge – using stickers. It features my best friend since high school Janice Caves-Frankland in October 2009. She and I met when I was 15, and we have never stopped loving each other. We’ve shared so many joys and so many sorrows. Love you forever my friend. Meanwhile, don’t forget to come play along with our two challenges over at Another Freaking Scrappy Challenge – you have until tomorrow night at 10 pm EST to do so. 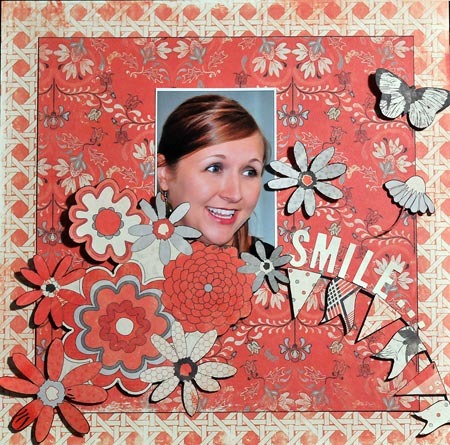 There’s a new sketch over at Another Freaking Scrappy Challenge and here is my take on it using Authentique Carefree Collection Radiant, Relaxed, Easygoing, and Content papers and featuring our daughter Nikki Pennington. If you haven’t played along with us yet, please do! You will enjoy yourself and make new friends!